Left: Lys Assia, the first Eurovision winner (1956), and Dima Bilan, winner in 2008. Centre: Johnny Logan, the winning artist in 1980, winning artist and composer in 1987 and the winning composer in 1992. Right: Ell & Nikki celebrating Eurovision Song Contest 2011 victory in Düsseldorf. Sixty-six songs have won the Eurovision Song Contest, an annual competition organised by member countries of the European Broadcasting Union. The contest, which has been broadcast every year since its debut in 1956, is one of the longest-running television programmes in the world. The contest's winner has been determined using numerous voting techniques throughout its history; centre to these have been the awarding of points to countries by juries or televoters. The country awarded the most points is declared the winner. 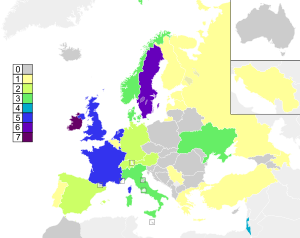 The first Eurovision Song Contest was not won on points, but by votes (two per country), and only the winner was announced. There have been 63 contests, with one winner each year except the tied 1969 contest, which had four. Twenty-seven countries have won the contest. Switzerland won the first contest in 1956. The country with the highest number of wins is Ireland, with seven. The only person to have won more than once as performer is Ireland's Johnny Logan, who performed "What's Another Year" in 1980 and "Hold Me Now" in 1987. Logan is also one of only five songwriters to have written more than one winning entry ("Hold Me Now" 1987 and "Why Me?" 1992, performed by Linda Martin). This unique distinction makes Logan the only person to have three Eurovision victories to his/her credit, as either singer, songwriter or both. The other four songwriters with more than one winning entry to their credit are, Willy van Hemert (Netherlands, 1957 and 1959), Yves Dessca (Monaco, 1971 and Luxembourg, 1972), Rolf Løvland (Norway, 1985 and 1995) and Brendan Graham (Ireland, 1994 and 1996). Winning the Eurovision Song Contest provides a unique opportunity for the winning artist(s) to capitalise on their success and surrounding publicity by launching or furthering their international career during their singing years. However, throughout the history of the contest, relatively few of these artists have gone on to be huge international stars. The most notable winning Eurovision artists whose career was directly launched into the spotlight following their win were the members of ABBA, who won the 1974 contest for Sweden with their song "Waterloo". ABBA went on to be one of the most successful bands of its time. Another notable winner who subsequently achieved international fame and success was Céline Dion, who won the 1988 contest for Switzerland with the song "Ne partez pas sans moi". For information about the winning songwriters of each year, see List of Eurovision Song Contest winning songwriters. Eleven Eurovision winners (alongside three non-winners) featured at the Congratulations concert in 2005, in which ABBA's "Waterloo" was voted the most popular song of the contest's first fifty years. Changes to the voting system, including a steady growth in the number of countries participating and voting, means that the points earned are not comparable across the decades. Portugal's Salvador Sobral holds the record of the highest number of points in the contest's history, earning 758 with the song "Amar pelos dois". Norway's Alexander Rybak holds the largest margin of victory in absolute points, a 169-point cushion over second place in 2009. Italy's Gigliola Cinquetti holds the record for largest victory by percentage, scoring almost three times as many as second place (49 points compared with 17 by the runner-up) in the 1964 contest. Under the voting system used from 1975 until 2015, the lowest winning score was Norway's Bobbysocks! 123 points earned (of the 216 available from the 18 other countries) when winning Eurovision 1985, while the lowest winning total ever is the 18 points (of the 160 total votes cast by 16 countries) scored by each of the four winning countries in 1969. Under the voting system used from 1975 until 2015, in which each country gives maximum points to its first place choice, Sweden's Loreen won Eurovision 2012 with the most ever first place votes earned, receiving first place votes from 18 of 41 countries (excluding themselves). The 1976 United Kingdom entrant, Brotherhood of Man with the song "Save Your Kisses For Me" holds the record of the highest average score per participating country, with an average of 9.65 points received per country. 2011 winner Azerbaijan Ell & Nikki, hold the lowest average score for a winning song under that system, receiving 5.14 points per country. The United Kingdom has finished second fifteen times at Eurovision (most recently in 1998), more than any other country. The most successful country never to have won the Contest is Malta, having finished second in 2002 and 2005 and third in 1992 and 1998. Another island nation Iceland has also finished second twice, in 1999 and 2009. There is no official runner-up for two of the contests – 1956 and 1969. In 1956 only the winner, Switzerland, was announced, whilst there were speculative reports that Germany ended up in second place with "Im Wartesaal zum großen Glück" by Walter Andreas Schwarz, given that Germany was chosen to host the 1957 contest. In 1969 four songs shared first place by achieving the same number of points; fifth place was achieved by Switzerland, which is not considered an official runner-up, because of the draw for first place. Year 1969 is in italics to indicate joint (4-way) win. Between 1966 and 1973, and again between 1977 and 1998, countries were only permitted to perform in their own language; see the main Eurovision Song Contest article. Lys Assia, winner of the 1956 contest for Switzerland. Corry Brokken, winner of the 1957 contest for The Netherlands. André Claveau, winner of the 1958 contest for France. Teddy Scholten, winner of the 1959 contest for The Netherlands. Jacqueline Boyer, winner of the 1960 contest for France. Jean-Claude Pascal, winner of the 1961 contest for Luxembourg. Isabelle Aubret, winner of the 1962 contest for France. Jørgen & Grethe Ingmann, winners of the 1963 contest for Denmark. Gigliola Cinquetti, winner of the 1964 contest for Italy. France Gall, winner of the 1965 contest for Luxembourg. Udo Jürgens, winner of the 1966 contest for Austria. Sandie Shaw, winner of the 1967 contest for the United Kingdom. Massiel, winner of the 1968 contest for Spain. Lulu, one of the four winners of the 1969 contest for the United Kingdom. Frida Boccara, one of the four winners of the 1969 contest for France. Lenny Kuhr, one of the four winners of the 1969 contest for The Netherlands. Dana, winner of the 1970 contest for Ireland. Vicky Leandros, winner of the 1972 contest for Luxembourg. Anne-Marie David, winner of the 1973 contest for Luxembourg. ABBA, winners of the 1974 and the 50th anniversary contests for Sweden. Teach-In, winners of the 1975 contest for The Netherlands. Marie Myriam, winner of the 1977 contest for France. Gali Atari, winner (together with Milk and Honey) of the 1979 contest for Israel. Johnny Logan, winner of the 1980 and 1987 contests for Ireland. Nicole Hohloch, winner of the 1982 contest for Germany. Richard Herrey from Herreys, winners of the 1984 contest for Sweden. Bobbysocks!, winners of the 1985 contest for Norway. Sandra Kim, winner of the 1986 contest for Belgium. Celine Dion, winner of the 1988 contest for Switzerland. Emilija Kokić, lead vocalist for the winning band Riva in 1989 for Yugoslavia. Toto Cutugno, winner of the 1990 contest for Italy. Carola Häggkvist, winner of the 1991 contest for Sweden. Linda Martin, winner of the 1992 contest for Ireland. Niamh Kavanagh, winner of the 1993 contest for Ireland. Secret Garden, winner of the 1995 contest for Norway. Katrina and the Waves, winners of the 1997 contest for the United Kingdom. Dana International, winner of the 1998 contest for Israel. Charlotte Nilsson, winner of the 1999 contest for Sweden. Olsen Brothers, winners of the 2000 contest for Denmark. Dave Benton, winner (together with Tanel Padar and 2XL) of the 2001 contest for Estonia. Marie N, winner of the 2002 contest for Latvia. Sertab Erener, winner of the 2003 contest for Turkey. Ruslana, winner of the 2004 contest for Ukraine. Helena Paparizou, winner of the 2005 contest for Greece. Lordi, winner of the 2006 contest for Finland. Marija Šerifović, winner of the 2007 contest for Serbia. Dima Bilan, winner of the 2008 contest for Russia. Alexander Rybak, winner of the 2009 contest for Norway. Lena, winner of the 2010 contest for Germany. Ell & Nikki, winners of the 2011 contest for Azerbaijan. Loreen, winner of the 2012 contest for Sweden. Emmelie de Forest, winner of the 2013 contest for Denmark. Conchita Wurst, winner of the 2014 contest for Austria. Måns Zelmerlöw, winner of the 2015 contest for Sweden. Jamala, winner of the 2016 contest for Ukraine. Salvador Sobral, winner of the 2017 contest for Portugal. Netta, winner of the 2018 contest for Israel. ^ Since 2004, the contest has included a televised semi-final::— In 2004 held on the Wednesday before the final:— Between 2005 and 2007 held on the Thursday of "Eurovision Week"
^ This song was partially sung in Ukrainian. ^ This song was partially sung in English. ^ a b c This song was partially sung in Hebrew. Cite error: Invalid <ref> tag; name "toy_(song)" defined multiple times with different content (see the help page). Cite error: Invalid <ref> tag; name "toy_(song)" defined multiple times with different content (see the help page). ^ 1979, 1980, 1981, 1984, 1988, 1991, 1993, 1998, 2002 and 2003. ^ the Federal Republic of Germany has two wins, one before and one after German reunification. The map depicts the outline of Germany during both of their wins. ^ a b The country used to participate under the name F.Y.R. Macedonia (The Former Yugoslav Republic of Macedonia). ^ a b c d This song was partially sung in Ukrainian. ^ a b c d This song was partially sung in Crimean Tatar. ^ a b Croatian (the language of the 1989 winning song) and Serbian (the language of the 2007 winning song) are fully mutually intelligible and often considered varieties of a single language, Serbo-Croatian. However, they are listed separately in Eurovision statistics. ^ "Nocturne" features unaccredited vocals from Norwegian singer Gunnhild Tvinnereim. ^ BBC News (6 December 2005). ABBA's Bjorn says no to reunion. Retrieved on 15 March 2008. Wikimedia Commons has media related to Winners of the Eurovision Song Contest. Eurovision Song Contest history. Eurovision.tv. Retrieved on 19 August 2007.